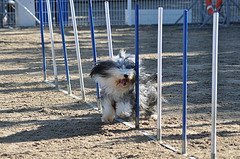 A dogs response to the challenges of an agility obstacle may vary between dogs, some will take to the idea like a duck to water, while the more timid dog will need more encouragement and may take several weeks before positive progress is made. 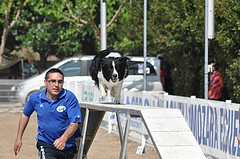 Once your dog has overcome any fears of the obstacles they will be very willing to perform the tasks presented to them. Try to put yourself in the dogs paws, and see things from a dogs eye view and you may understand why they are hesitant to step onto a teeter-totter board, If you have ever walked across a rope bridge remember how you felt when taking your first step, the ground moving beneath your feet, throwing you off balance, the drop below you, legs feeling like jelly, heart rate going through the roof and remember you had a hand rail to hold onto. If you could step off safely, or better still just not step on in the first place you would, it's called self preservation, dogs are no different. The most difficulties arise with dog agility training when you introduce your dog to the teeter-totter otherwise known as the see-saw and the weaver poles. These being the more challenging of the obstacles they will encounter. Many dogs will not like the see-saw at first as they will not feel secure as the balance pivots, this is understandable and with patience and reassurance you dog will soon master this and gain confidence. Likewise the weaving action in and out of weaving poles is not a natural action for dogs and has to be learned. 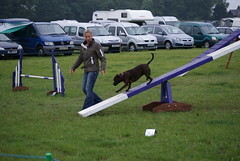 Remember that the dog will be looking for your guidance so you must be the one to direct the dog through the obstacles and over the jumps throughout the course, having first studied the agility course plans in advance, practice, practice until you and dog jell as a team and form a great partnership which in turn strengthens the bond between you, which is good either for competitions or just for exercise and enjoyment. If you prefer backyard dog training then making dog agility equipment or buying some used dog agility equipment may be the answer. Whichever method of dog agility training you choose enjoy it!